The judges for the 2014 Global Mobile Recruitment Awards were today announced by Mike Taylor from the awards organisers Web Based Recruitment. “In selecting the judges for these inaugural awards I felt it was important to have a wide breadth of knowledge and experience across all aspects of recruitment. In addition, I saw experience of mobile audits and usability as a key role in the judging process and I am confident that the judges will do an excellent job in evaluating the entries for these new, exciting awards,” commented Taylor. The 2014 Global Mobile Recruitment Awards will acknowledge those companies around the world leading the way in the use of Mobile Recruitment and at the same time help raise the awareness of Mobile Recruitment best practice. Full details of how to enter can be found at: http://www.MobileRecruitmentAwards.com/enter. The closing date for entries is the February 28th, 2014. The award winners will be announced by live video stream on the March 27th, 2014. 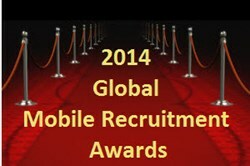 Further information about the 2014 Global Mobile Recruitment Awards can be found at: http://www.MobileRecruitmentAwards.com. Any companies interested in becoming a sponsor of the awards should contact Mike Taylor or telephone +44 (0) 1962 883754.